Dès ce soir, la toute nouvelle version de FreeTrack, FreeTrack v.2 est disponible sur FreeTrack Online. Vous pouvez la télécharger ici : Page de Téléchargement. - les modes Single Point et 3 Points Clip qui permettent respectivement d'utiliser 1 DEL ou 3 LEDs sur un clip pour le casque micro. - et plein d'autres options ! Pour fêter ça, un assistant interactif au montage va vous aider à construire votre système. Faites circuler l'info, et amusez vous bien avec FreeTrack ! As of this evening the lastest Freetrack release, Freetrack V2, is available on Freetrack Online. You can download it here : Download Page. 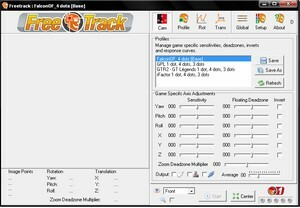 - 2 new tracking modes (1point and 3points clip which respectively allows you to use 1 LED or 3 LEDs on a headset clip). - Fine adjustments , with the ability to define dead zones. - Plenty of other features !! !!! To celebrate that, a Led Assembly Wizard will help you to build your system. Tell everybody the good news , and have fun with FreeTrack !!!! Freetrack is awesome. I had low expectations - this thing works as well as my brother's AUD$250 TrackIR and it cost me the grand total of AUD$11 in parts and an hour or so to build. Brilliant! You guys are doing a great job, I just wanted to say thank you.